Fun and educational pets, aquatic turtles can be prone to skin fungus. If left untreated, the fungus may become lethal. Frequently examine your aquatic turtle's skin for signs of skin fungus. Consult a veterinarian who specializes in turtles if you suspect skin fungus or other health issues. Fuzzy white or gray patches on your turtle's skin may indicate fungal infection. Other symptoms can be flaking, peeling, blisters or the presence of a cheeselike substance on his skin. Normal skin shedding doesn't produce white patches, redness or swelling. Skin fungus is often caused by poor water quality or an inadequate basking area. Remove your infected turtle from his tank and gently wash him with warm water, scrubbing his shell with a soft toothbrush. Soak him in a commercial antifungal solution for turtles, or prepare a solution of 1 part povidone iodine to 100 parts water. Soak your pet in enough solution to just cover his shell for 15 minutes, daily until all signs of the fungus are gone. After allowing your turtle to dry, apply a thin covering of antibiotic ointment containing betadine to the fungal patches. A few salt baths may be all your turtle needs if you detect the fungus in its early stages. Make a solution of 2 tablespoons salt in a gallon of water at 80 degrees Fahrenheit. Soak your pet, just covering his shell, for 15 minutes, once or twice daily for four or five days. Allow him to dry completely after his soak, but don't leave him out of his tank for more than two hours. 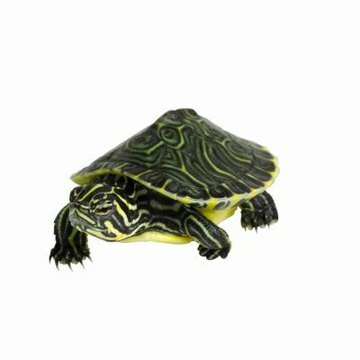 Before returning your turtle to his tank, clean and disinfect it and all of its accessories using a mixture of 1 part chlorine to 100 parts water. Rinse everything thoroughly and allow it to dry completely. Put new substrate in place before setting up the tank. Perform a water change daily for the duration of the treatment. Follow a few simple steps to prevent skin fungus from infecting your aquatic turtle. Perform a weekly water exchange of half the tank's water, removing the filter and rinsing it with cool water. Add a vitamin C supplement to your turtle's diet. Avoid food contamination of his tank by feeding him in a separate, smaller tank. Supply 12 hours of light daily, using a UVB lamp or natural sunlight. Use the proper water temperature for your species of turtle, and provide a basking area large enough for him to get completely out of the water.